When I found out the Women’s March on Washington was on a Saturday, I had an important choice to make. Like many other Jews, I don’t do work on Shabbat. I love that the practice of Shabbat is modeled on the divine’s day of rest after the creation of a perfect world. So once a week we are given the opportunity to live as if the world is flawless. As if we, through our actions of the past week, have worked hard enough to make the world whole and for one day we are not obligated to labor or make change. We are provided a metaphorical deep breath and chance to reflect on all the good around us. But Judaism also gives us the principle of pikuach nefesh, the idea that the preservation of human life overrules nearly any other religious consideration. When someone is under immediate threat, our commandments not to act become irrelevant. The current political situation and the threat of our new administration’s actions is a real and clear threat to people’s lives. It’s not theoretical or a hysterically imagined future. And it is at odds with our Jewish values. I’m taking action because an administration came to power that has already shown itself not only to believe that some people are more human or more deserving than other people, but have already started to create policy based on those discriminatory beliefs—policies that will cost people their livelihoods, their health and their lives. The Torah insists that we maintain the dignity of the poor and work to provide them with a way out of poverty. But President Trump’s administration has promised tax cuts that would reduce federal income by over $6 trillion over the next decade, and experts say that creating his “balanced” budget will plunge more people into poverty: Medicaid will shrink, the Children’s Health Insurance Program will get smaller, the supplemental nutrition assistance program will be cut, housing and energy assistance for the poor will decrease, and more. I didn’t march, as some would accuse, just because “my candidate lost.” I’m taking action because an administration came to power that has already shown itself not only to believe that some people are more human or more deserving than other people, but have already started to create policy based on those discriminatory beliefs—policies that will cost people their livelihoods, their health and their lives. After marching in Selma, Ala., with the Rev. Martin Luther King Jr., Rabbi Abraham Joshua Heschel said, “I felt my feet were praying.” I understand that feeling. 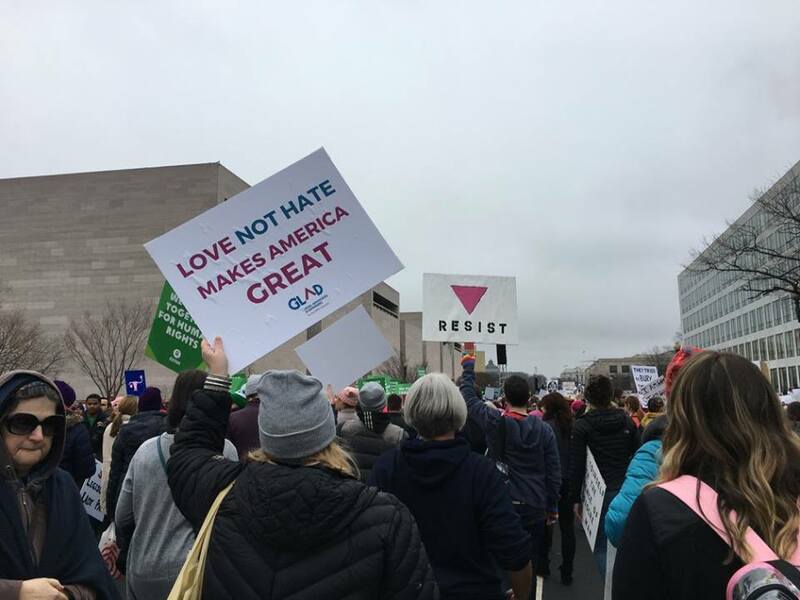 Marching on Shabbat—fighting for the rights and dignity of all people—felt, to me, like the greatest way to recognize the divine spark in each of us and to recognize our holy obligation to save lives. The march has spurred my commitment to take one action every day to combat the bigotry, hatred and life-threatening policies we are seeing in our highest levels of government: calling an elected official, writing to a news outlet that is not reporting the truth, making a donation to a critical issue, having a hard conversation with someone who doesn’t think voting matters. My Judaism is rooted in the value of justice. And I am committed to raising my children in a Jewish community and a larger world that teaches us to care for each other and see ourselves in the strangers around us. But I know that for that world to exist—for that Jewish community to be real—it is my responsibility to stand up, speak out and create the reality I want to see.